Red rice is another example of a low GI unhulled or partially unhulled grain with a nutty flavour and a high nutritional value. Served warm or cold, this dish has been one of favourites lately because it's filling and versatile. 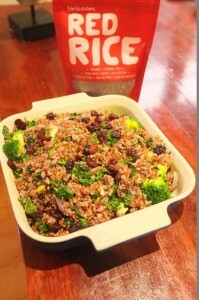 Cook the red rice according to packet instructions, drain, fluff up and set aside. Steam the broccoli in small florets and set aside. Gently pan fry the onions, garlic and cumin seeds in a little olive oil with the bay leaf until the onions have softened - don't burn the cumin! Add the cooked rice to the saucepan then the broccoli and cranberries and stir through. That's it! So simple and really tasty. Adjust olive oil and seasoning to taste.